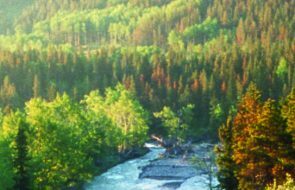 Shortly after noon on July 29, 1985, a careless driver reaching for a dropped cigarette veered onto the shoulder of the Trans-Canada Highway near Calgary, slamming into a group of teenage cyclists headed to Kananaskis for a camping holiday. He killed three and injured six. The non-profit Trans Canada Trail Foundation organization launched in 1992 as part of Canada’s 125th anniversary celebrations. 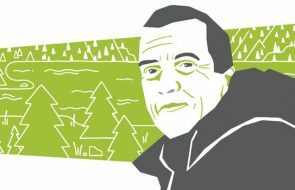 Pratt was president; Pierre Camu, a former president of the Royal Canadian Geographical Society, became board chairman. Riding a wave of optimism, the new foundation described the Trans Canada Trail as a millennium project, to be completed by July 1, 2000. Later, as unanticipated obstacles accumulated, this target was extended to July 1, 2017, Canada’s 150th birthday. Canada already possessed many excellent pathways, making up 20 per cent of the planned trail, and Pratt envisioned quickly and economically linking them by “recycling” abandoned rail corridors. At its best, the Trans Canada Trail would be six metres wide and include two parallel pathways to accommodate hikers, cyclists, roller-bladers, wheelchairs, horses and—in winter—cross-country skiers. The east–west route would feature a hard surface in high-use areas, to be extended eventually across the country. Part of the northern route, passing through Edmonton and Inuvik to the Arctic Ocean, would include a waterway, the Mackenzie River. During winter months, snowmobiles might be permitted in remote regions not accessible to hikers or cross-country skiers. The trail would be dotted at regular intervals with shelters and, when necessary, campsites. Although the founders waxed eloquent about the trail’s potential to foster unity and stimulate tourism, they placed special emphasis on public safety. Pratt insisted that the trail be built far enough from roads to mask traffic noise and avoid collisions. According to David Hargrave, then Alberta TrailNet coordinator, automobile accidents involving cyclists and pedestrians motivated many people to join the Trans Canada Trail movement. He told the Herald in 1994: “We don’t want it along a highway or in a ditch. We want the whole thing to be like a park.” Safety-minded organizations, including the RCMP and the Canadian Truckers Association, quickly endorsed the project. Like many Canadians, my wife Elizabeth was an early and enthusiastic supporter of the Trans Canada Trail. We made charitable donations, “bought” metre-long sections, acquired logoed merchandise, purchased maps and guidebooks and became card-carrying “Trail Builders.” We eagerly anticipated a world-class greenway that would connect communities, foster healthy lifestyles, respect environmental values, encourage active transportation and, most importantly, provide a safe travel route for pedestrians and cyclists. Elizabeth firmly believed motor vehicles pose an extreme danger to cyclists on roadways—it is a self-evident truth. When she agreed to accompany me each summer on a three-week cycling holiday, she set one solemn condition: no roads. Sensible and careful, very safety-conscious, she refused to risk her life by venturing onto routes used by motor vehicles. I thought her fears were exaggerated—I’d been riding on busy streets and highways without incident since childhood—but I was happy to acquiesce. It was the least I could do. Since our first meeting at age 12, she had been the love of my life. For almost a decade I planned our annual trips meticulously, poring over detailed maps and trail guides, methodically marking out our daily itinerary. We pedalled in Europe—England, Scotland, Ireland, France and Slovakia—and in alternate years our home country, Canada. Here we travelled on the Trans Canada Trail, widely advertised as a safe and scenic coast-to-coast-to-coast greenway, but where—much to our consternation—the official guidebooks repeatedly took us on perilous journeys along motorized thoroughfares and highways. Until one sunny afternoon in Prince Edward Island in 2012, when Elizabeth was struck down by a tradesman’s blunt-nosed van and died on a lonely rural roadside. I struggled desperately to survive devastating trauma—but also to comprehend the tragic failure of Canada’s much-vaunted trail-building dream. Deep down I already knew the answer but wouldn’t admit it, until a long-suffering trails official quietly confided: “Ed, the emperor has no clothes.” The Trans Canada Trail—pretentiously renamed “The Great Trail” in 2016—has become little more than a dangerous hoax. It is not a greenway; it is a motorway. How did this happen? What went wrong? The TCT Foundation proposed to achieve their awe-inspiring dream for a new national transportation corridor by taking a page from Calgary’s successful Olympics: It would rely on volunteers, private donations and corporate sponsorships. This strategy had generated $450-million in recreational facilities for Calgary; Pratt believed it would produce $440-million in non-motorized trails for Canada. Governments—federal, provincial and municipal combined—would assume only a tenth of the total cost. Equally problematic, however, has been rural opposition. 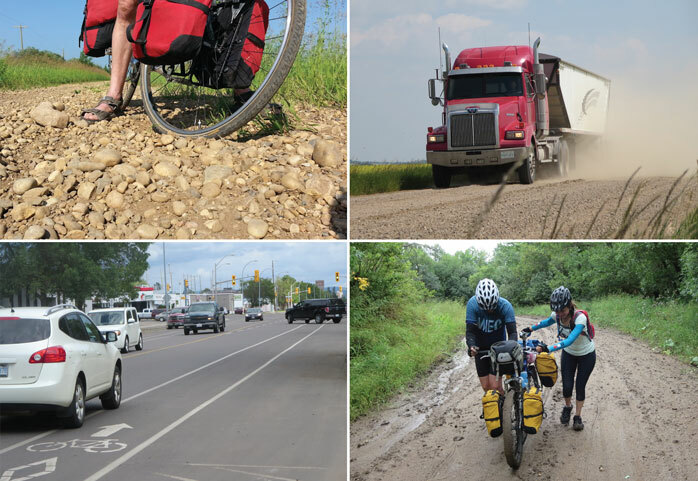 The Trans Canada Trail currently passes through nearly 1,000 municipalities and more than 15,000 communities which, quite naturally, give priority to local needs, not national projects. Why should they put resources into a trail intended for outsiders? (Only effete urbanites ride bicycles, I have been told; rugged rednecks drive quads.) They also have concerns about property ownership, liability, maintenance and potential trespassing. In Alberta, for example, rural protests led to the shelving of a proposed Calgary–Edmonton trail to be built on the 303 km Irricana–Drumheller–Camrose railbed at an estimated cost in 2000 of $6.3-million. Although CP Rail donated a section between Irricana and Torrington to the TCT Foundation—subsequently transferred to Alberta TrailNet—adjacent landowners successfully lobbied municipal councils to refuse zoning for trail construction, and then erected illegal barriers and warning signs to block access. This recurring opposition has played havoc with route planning. As it frantically searches for available pathways and co-operative communities, the Trans Canada Trail has leapfrogged in all directions, turned around and hopped back, then added new paths and abandoned old ones. The result has been a dizzying inflation in the trail’s proposed length. Originally predicted to be 15,000 km and subsequently projected at 16,200, 18,000 and 22,500 km, the planned route now logs in at 24,000 km. By contrast, the Trans-Canada Highway from Vancouver to Halifax is 5,890 km, and the Via Rail trip is 6,350 km. Lacking both uniform standards and control, the Trans Canada Trail includes a confusing and dangerous hodgepodge of mountain-bike paths, roadside ditches, dirt ruts, gravel roads and hazardous ATV trails. The original dream lies in widely scattered pieces, unlikely ever to be restored unless the Canadian government intervenes and establishes rational standards for quality, safety and routing. Surprisingly the Trans-Canada Highway, first proposed in 1912, faced similar challenges. Provincial and municipal governments, preoccupied with local construction, balked at building an interprovincial roadway passing through sparsely populated regions. In 1948, however, Canada’s new minister of Reconstruction & Supply, Robert Winters, seeking to reduce post-war unemployment, championed a hard-surface highway that would follow the shortest practicable route across Canada. At a federal–provincial conference that December Ottawa promised to pay 50 per cent of the construction expenses if the provinces met agreed standards not only for surfacing but for gradient, curvature, sight distances and load-bearing capacity. (Alberta unsuccessfully demanded a contribution of 100 per cent!) When the Trans Canada Highway was finally completed in 1970, the federal government had paid $825-million of the $1.4-billion total cost. 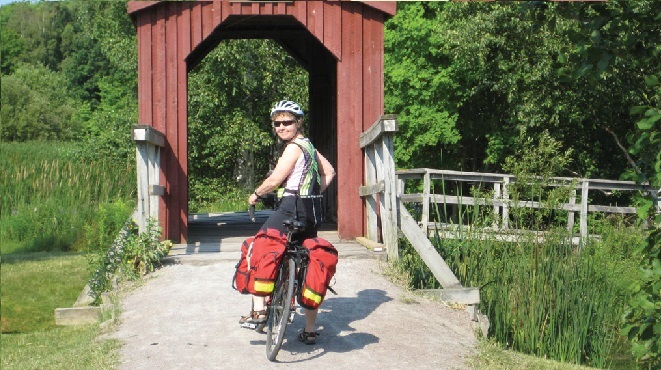 In summer of 2008 Elizabeth and I set out on a cycling trip that included Alberta’s longest stretch of “operational” Trans Canada Trail, the 177-km Iron Horse Trail linking Waskatenau and Heinsburg. We soon discovered, however, that the trail—composed of loose gravel, soft sand and rough ballast—was used only by ATVs. After struggling laboriously for 16 km, and yielding frequently to ATVs, we finally detoured onto hard-packed township roads that, ironically, had less motorized traffic. Shortly afterwards, with undisguised indignation, Elizabeth announced that she would campaign for the development of a Trans Canada Trail in Alberta that would be safe and accessible for pedestrians and cyclists. I was startled and dismayed. “You’d have to get involved in politics,” I warned, “and that’s going to be frustrating and futile. Don’t do it.” But she wouldn’t be swayed, and I reluctantly promised that I would do my best to support her. After setting out on a much-anticipated cycling holiday in Manitoba—where the TCT was proudly proclaimed to be 91 per cent operational, Elizabeth and I suffered a rude awakening. The trail was mainly on roadways. On July 12, 2010, we pedalled north from Winnipeg, taking a zigzag course along peaceful residential streets and then a meandering route along busier suburban avenues and rural highways, stopping regularly to consult our trail map. At the 30-km mark we gratefully reached a paved cycling trail built on the tiered embankment of the Red River Floodway that, according to the TCT guidebook, would take us directly to our evening destination, 20 km farther, the town of Lockport. The trail ended after only 4 km—the rest had yet to be built—and we dragged our bikes through the brush to the nearest roadway. Then, as traffic whistled terrifyingly close by, we cycled grimly along the two-lane Henderson Highway. Near Lockport, we regained the Trans Canada Trail as it joined Highway 44, and then dodged and jostled with tourist traffic and heavy machinery on a signed detour. That evening, when we took refuge in our bed and breakfast, Elizabeth vented. “That’s it,” she declared furiously. “I’m not doing this ride anymore. It’s too dangerous. I’m going back home to Edmonton.” I had no choice but to cancel our vacation. In short, motorized vehicles had already ruined many sections of the Trans Canada Trail and, without new expenditures, these paths were no longer suitable for cyclists. I’ve repeatedly called on the federal government—in particular Mélanie Joly, minister of Canadian Heritage, responsible for Canada’s 150th anniversary celebrations—to fund the Trans Canada Trail as they did the Trans-Canada Highway. A federal spokesman said the government would continue putting millions into the project but would not dictate how the money was spent. How many millions exactly? In 2015 the Government of Canada donated $5.5-million to the TCT Foundation while dispensing $150-million to local communities for infrastructure projects—picnic shelters, flagpoles, dock repairs—to mark Canada’s upcoming 150th anniversary. In early 2015, with 20 per cent of the trail still incomplete, and with July 1, 2017, looming on the horizon, national organizers directed the regional associations to route the Trans Canada Trail along highway shoulders where possible, in order to close the remaining gaps. 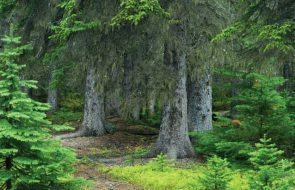 At that time, Alberta had completed only 43 per cent of its land-based trail, and the implications were obvious. Elizabeth and I had fond memories of New Brunswick—its welcoming people, its bilingual culture and its scenic beauty—and for many years we longed to return on our bicycles. But a quick look at the Trans Canada Trail map revealed we would have little choice but to ride on highways. So Elizabeth quickly vetoed it, insisting instead that we take our annual cycling holiday in Prince Edward Island. Not content to leave well enough alone, I adjusted our plans so that we could fly first to Moncton, New Brunswick, and then cycle along the Trans Canada Trail to Prince Edward Island. Unfortunately the first 50 km of this trip would be on a two-lane highway, and when Elizabeth discovered this, shortly after our arrival in Moncton, she was very displeased, noting in her diary: “Ed is ticked that I don’t want to do this part on roads. I’m ticked that he doesn’t listen when I say avoid roads.” And so, after a somewhat strained discussion, we disassembled the bikes, packed them into cardboard boxes and took the train to Sackville. From there we pedalled along a railbed, struggling through minefields of swampy potholes and jagged rocks, until we reached Malden. Then, on Saturday, July 14, 2012, with huge sighs of relief, we loaded our bicycles onto a shuttle bus to carry us over the 13-km Confederation Bridge to Borden-Carleton, PEI. After disembarking, we cycled northeast for 18 km on a red, hard-packed stone-dust path until we reached Emerald, the junction with the main trail, and then turned right, heading easterly towards Hunter River, the overnight destination recommended in the Trans Canada Trail guidebook. The trail was smooth and flat and comfortingly non-motorized; the setting was pastoral and peaceful and idyllic. At Hunter River, however, we stopped and stared in stunned silence and incredulity at the designated route—the only route—to our accommodation: a two-lane highway. There was an intermittent shoulder, sandy and gravelly, often downsloping, seldom rideable, and we proceeded apprehensively along the white fog-line marking the road’s edge. Elizabeth was visibly sullen and upset, a smouldering volcano preparing to erupt when we arrived. But we never did arrive. A few minutes later, she was struck by a brown Chevrolet Express Van. The impact severed her brain stem and threw her body 50 metres. In the year 2012, Elizabeth Ann Sovis was one of 61 cyclists killed by motor vehicles on Canadian roads. Another 6,608 were injured. Edmund A. Aunger is professor emeritus of political science at the University of Alberta, Campus Saint-Jean.